The new Theo chair works in a variety of settings. Image courtesy of Kimball Office. One of the multiple 2017 product introductions by Kimball Office’s included the Theo seating line. Debuting at NYCxDESIGN in May the line achieved a #MetropolisLikes Award. Awarded bi-annually by Metropolis magazine. 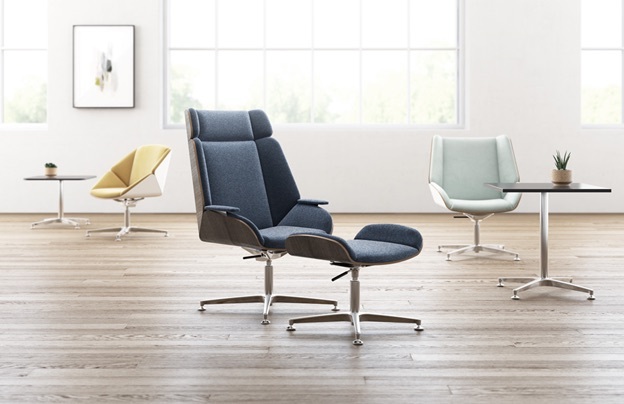 Theo was also one of Kimball’s new products featured at June’s Neocon event in Chicago. The Theo product line was designed by Jay Henriott of Kimball Office. The design gives the nod to the mid-century classics that utilized molded wood frames with upholstered interior seating area. How about some of the main design features? We wanted to create a product line that was scaled to work in multiple environments. We think we have provided a large-scale look with a smaller footprint. With multiple seats, back and base options, designers have a range of choices that will work in spaces from reception to casual meeting areas. Theo works in front of and behind the desk – or in the open office. Images courtesy of Kimball Office. Yes, we thought about all the ways the Theo could work in the office environment. Based on function, the chair can be specified to meet almost any seating requirement. Polished Aluminum Base, Caster, and Glide details – All detail images courtesy Kimball Office. How will the product impact the workplace and contribute to new ways of working? Theo can be specified to fit almost any situation notes Heather Nemoir, IIDA, Partner and General Manager of Metro-Milwaukee Based Corporate Design Interiors. When will Theo be available? Theo “seating” is available for order entry now. “Tables” will be available in the fall. More information can be found here.